Style icon and depression advocate Audrey Gruss has launched hope – “the uplifting fragrance,” at Saks Fifth Avenue just in time for the holidays. This critically acclaimed collection consists of an Eau de Parfum Vaporisateur Spray; an Eau de Parfum Purse Spray; a Hand and Body Crème and a heavenly scented candle. This elegant collection is also available online at www.saks.com. Thanks to Gruss, this trend setting fragrance will give 100% of its net profits to the Hope for Depression Research Foundation to fund much needed research for new drugs and treatments to fight depression. “This glorious fragrance stands on its own, but the charitable message empowers you to give back with a product that keeps on giving,” said Gruss. Candace Bushnell, Lorraine Bracco and Hilary Geary Ross led the perfumed pack to the holiday lunch that Audrey Gruss and Marc Metrick, the President of Saks Fifth Avenue co-hosted at Café SFA to introduce hope parfum. The fragrance was created in collaboration with Firmenich’s master perfumer Honorine Blanc, while the chic packaging was designed by award winning designer Marc Rosen. Karen LeFrak, Jamee Gregory, Hilary Geary Ross, and Dayssi Kanavos gathered at tables festooned with lily of the valley, jasmine, gardenia and tuberose, the blooms that are used in the perfume. “My mother, whose name was Hope, suffered from depression but loved white flowers and surrounded herself with them. She loved the pure and delicate essences and the sense of joy they brought her. I was inspired by her memory to create this fragrance, just as I was inspired 11-years ago to start the Hope for Depression Research Foundation,” said Gruss. HDRF is the leading non-profit dedicated to advanced depression research in the United States. It funds the most innovative neuroscience research into the origins, diagnosis, treatment and prevention of depression and other mood disorders, including bipolar disorder, postpartum depression, post-traumatic stress syndrome, anxiety disorder and suicide. Audrey, who is a fixture on best dressed lists, was awarded an Honorary Doctorate of Philosophy from the University of Haifa, for her courage and perseverance in creating a research foundation to support this visionary mission. She graduated with honors from Tufts University with a Bachelor of Science degree in Biology. A fellow of Tufts University, she has also established The Audrey Butvay Gruss Science Award for women. In 2010, HDRF launched its Depression Task Force – a brilliant collaboration of seven leading scientists, at the frontiers of brain science, from different research institutions across the U.S. and Canada. These scientists have developed an unprecedented research strategy that integrates the most advanced knowledge in genetics, epigenetics, molecular biology, electrophysiology, and brain imaging. To accelerate breakthrough research, they share ongoing results, in real time, at the HDRF Data Center. This year, HDRF honored Ashley Judd for speaking out about her struggles with depression and bravery for exposing Harvey Weinstein’s despicable behavior. 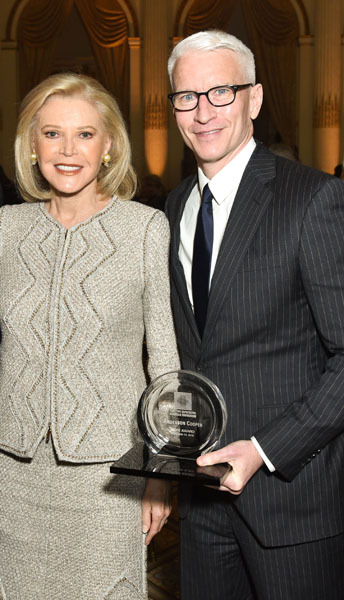 Anderson Cooper, Brooke Shields, Mariel Hemmingway and Mayor de Blasio’s daughter Chiara de Blasio have also been honored for their advocacy on behalf of those suffering from depression.